We invented On-line Tendering, with the first system built from a hundred telephone lines connecting to a multi-tasking database, way back in 1989. That's well before the public internet. We are just as dedicated to the future development of online tendering as we were back in the beginning and we will continue to provide the best tendering platform for searching and advertising tenders within Australia, New Zealand and the Pacific Islands. 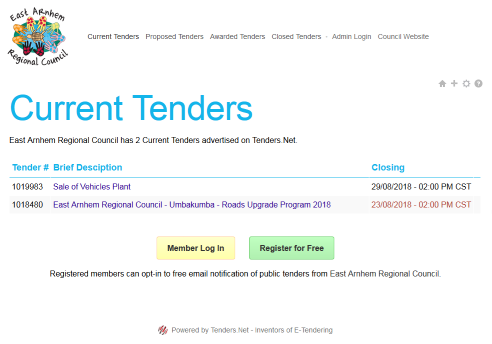 Every single publicly available tender opportunity in Australia and New Zealand can be found on Tenders.Net. Many companies choose Tenders.Net as their notification provider because of the confidence they have in our ability to continue providing a service where no tenders are missed. Our database of tenders is always growing as we constantly stay on top of an ever-increasing list of digital and print media sources to ensure you stay informed. Our guaranteed comprehensive coverage of publicly available tenders includes many opportunities that have been advertised directly onto the Tenders.Net platform by our registered advertisers. Many of our advertisers have a Direct Tendering Portal (DTP) that provides a central point for suppliers to find and respond to their tenders, both public and private. We guarantee our listing of public tenders, to be 100% comprehensive. All our opportunities are picked up in a quick and timely manner. Our extensive archives go back through decades of tendering. Our experienced team can assist you with customising your searches to cover your individual requirements. Paid Subscribers can search every publicly available tender throughout Australia and New Zealand for relevant matches. Premium Subscribers can enjoy additional coverage of Proposed Tender notices and Tender Awarded information. A Free Membership to Tenders.Net will give you access to thousands of tenders without charge. Afterwards you may upgrade to get access to many more.